Chef trainee Mark Connolly puts the finishing touches on a dish. Among students seeking summer internships, it’s usually a given that you want a job that lets you do more than make coffee. For Mark Connolly, however, making coffee was the point of his summer stint. Coffee . . . and lunches, and dinners . . . You see, Connolly has been a chef trainee at the Parrot Cay by COMO resort, learning on the job under the supervision of Executive Chef Stefano Cavallini. As a student at the Culinary Institute of America in Hyde Park, New York, this has been a valuable internship in paradise. As a native of the Turks & Caicos, Connolly is following a unique career path. But then, he has had some unusual life experiences in his 19 years. Mark is the son of Deputy Speaker of the House of Assembly Hon. Josephine Connolly and Joseph Connolly, senior partner of PricewaterhouseCoopers Turks & Caicos. His twin sister, Anne-Marie, is a journalism student at the University of Central Lancashire in the UK. Mark spent his first six years on Provo before going to boarding school in England, yet it was back in the Turks & Caicos that he found his calling in the kitchen. “When I was growing up, being taken to dinner parties or events, I was drawn to what was going on in the kitchen,” he says. So when he returned to the Islands for a visit, he decided to give the idea a try. He got a job in the kitchen at Amanyara, the exclusive resort tucked away on Provo’s northwest shore, “just as a trial,” but enjoyed the experience so much he stayed for more than a year, working under the tutelage of Executive Chef Fritz Zwahlen. Seeing how Connolly took to the job, Zwahlen suggested he attend a six-week restaurant program in Spain at Ramon Freixa Madrid. Connolly says the program at the famous restaurant was both eye-opening and encouraging. “There were 12 trainees from all over the world,” he explains, and he was given an international perspective about the culinary arts. While there he learned about the rigorous and top-rated program at the Culinary Institute of America, known in the culinary world as simply the “CIA.” After returning to Amanyara for a few more months, Connolly applied to and was accepted there. The world-reknowned CIA was established in 1946 as a vocational school for returning American World War II veterans; over time the nonprofit college became known for its high standards. Now it offers both bachelor’s and associate’s degrees as well as shorter enrichment programs. The school’s most popular course involves a six- to seven-month academic program and three to four months of hands-on training, with an option for another, more advanced, year of training. Students can also extend the program to receive a bachelor’s degree. “Everything is solely focused on food,” Connolly says, adding that he intends to go on for the bachelor’s. Perhaps because of his early days on Provo (“My mother was my first chef, and they say that as a baby, I enjoyed watching her cook and asking questions,” he recalls), Connolly has been drawn to Caribbean and Asian foods. So for his break at the CIA he sought an internship at Parrot Cay by COMO. “This is one of the top restaurants in the Turks & Caicos,” he says, and its combination of the cuisines he likes best makes the place a perfect match for him. “I keep getting blown away by everything I’m learning,” he says. Connolly notes that he still has far to go, but he has his eye on a future with Asian-style foods. After he returns to New York in January for another year at the CIA, his next step could be another internship in Singapore, perhaps. Eventually, like most chefs, he would like to open his own restaurant. Despite the fact that he is only 19 and still a student, Connolly is already influencing others. 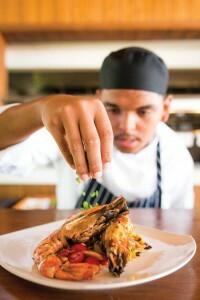 He is encouraging a cousin to stick with work at Amanyara “because he might fall in love with it, like me,” and a colleague at Parrot Cay is headed toward culinary school in the United Kingdom this fall. Even as a student, Connolly is becoming a culinary leader.